We all want traffic to our blog or website right? so why not learn how to do it and save some money at the same time. With Bing ads and my 5 tips that will save you money I can show you how to avoid the budget drain and still achieve the traffic and revenue needed to make your site profitable. Let your bing ads make you the King of Bing. Pay per click marketing is a way to get instant eyes on your content. The catch is, that you have to pay for it. If you are lucky enough to have an ad show up on page 1 of a high traffic keyword you can normally expect a high volume of visitors, there are a few factors that can help or deter that but for the most part you should see a traffic jump. The issue is, can you afford it? Let’s say you have a great article and you want to show it off to the world and you set up your bing ads campaign and get all set up and make an ad with your target keyword, and boom all is golden right? Not so fast. Without using certain methods you most likely will spend way more than you planned for. Let me show you what I mean. Broad Match- Basically is any phrase that includes your keywords or even part of the keyword phrase, I like to call it the splatter effect. Exact Match- is exactly what it sounds like. Your ad is triggered when a search is conducted for your exact keyword phrase, with no deviation. This is even more refined than Phrase match. Knowing your target audience is key in this case. If you go too broad with who you are targeting you risk paying for clicks with little to no results after that. Bing ads has a nice feature that allows you to select multiple options for demographic targeting. Age range, Locations and others. In this image above I used one of my campaigns that I run that targets certain countries, it helps refine my ad to the targeted set. This is one that I used to target primarily English speaking countries. I can broaden that to include all countries or I can just add a few others, but either way it shows how you can target the desired area for your ads. As you can see there are several countries on this list. One of the companies I am affiliated with does not offer certain services to these countries due to a high volume of fraud coming from these countries. So I have chosen to not look for clicks from these specific locations, which saves me cost for advertising. You can go a bit deeper with controlling your costs by running ads at specific times and dates. Increasing or decreasing your bid amounts based on when you think you will see the most traffic like on a Weekend or a Friday night. You may have a promotion running for a limited time, this setting will help you control that. You may have a similar issue when setting up your campaigns. The product or service you provide may not be valid in certain area’s. This option helps you by not getting extra charges for clicks that cannot help you by purchasing. You might think that sending out your info to as many people as possible regardless of demographics and location is the way to go. It may be for a mature website that has authority within their niche market but especially for new sites using these methods will help you convert better which leads to revenue to fund more Bing ads campaigns and in turn grow your business to the point that you can cut it loose a bit more with your keywords and audiences. One of if not the most important pieces of this puzzle is Relevance. You have to make sure you are leading your reader to what they expect to see from your ad. In other words’ no spammy sales page that is unrelated to the topic in your ad. If someone is looking for best gardening equipment and you send them to your join now sales page for some other product, you will certainly lose customers. That same person looking for best gardening equipment can be a potential customer if you send them to your page on gardening supplies and the content is in line with what you said in your ad. This is a must. Be relevant and truthful and you will have a much greater chance of success. You can test several variations of your ad that go to the same post, but you still need to make sure of the relevance to the article. When you get something to start converting for you with Bing ads, look at the ad and see what is working, learn from that and double down on future ads, meaning either scale up your campaigns that are producing or try other ads in similar keywords to see if you can get the same results. Scaling up your ad campaigns will obviously help you out, but you need to make sure it is converting before you go in to heavy. When doing any sort of PPC campaign it is very important to know your budget and use the options to make sure you do not go beyond your means. The cost of PPC can easily get out of control quickly. Example: When I started out back in 2004 I experimented with PPC options and did have success but also learned some valuable lessons. I got to far ahead of myself with one of my bids and spent $400 in a couple hrs, because I hit a high traffic keyword and paid for page 1. It was expensive and at the time that was quite a bit to spend on one ad. This is just an example of how things can get out of control if you do not set your budget and stick with it. Bing has a section in the settings area under accounts and billing. In that display you have the option to set pre-paid funds into your account, like $50 for example and when you spend that your ads stop running. So it helps to keep some control. That is one way to set a budget in bing ads. When you combine all of what I showed you here today and apply them to your ad campaigns, you should be able to have a much better return on investment with your ads. Try to resist the urge to go big when you start out. I am sure you can find many great keywords to target with your next post, so just see what happens when you use these methods on your next article. I bet you see better results than previously. Especially important is the targeted audience and demo graphics to match your intended customer. Using Phrase and Exact match will also be a big deal. Once you get the income generating you can open it up a bit and be more broad on your promotions. I hope this helped you find out how to save money and also how to avoid some mistakes that can pop up. What methods are you using for your PPC? Are you having results from your campaigns or spending too much money? Leave a comment below and we can all benefit from it. This is an informative post, I have heard of bing ads before but i never knew how they worked or how one got to apply for them. You have really gotten into details especially the part of targeted audience, this way you get to reach relevant people and can analyse your result. The only piece you didn’t mention is how much this would cost, does doing a general ad and a targeted ad cost the same? Good comment, This is a question that many people are curious about. There is no additional costs associated with the options I listed in my article. 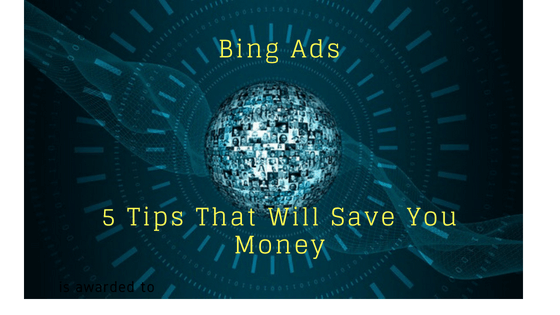 You can get setup with your Bing ads account in a few minutes and start configuring your ads and campaigns. I would suggest split testing, meaning try a few different ads for the same post to see what drives more traffic. Just make sure you keep the ad title and description relevant to the subject matter in your post. People will run for the hills if they feel they have been mislead, so keep that in mind. You can setup many great filters and reports for your data as well, at no additional cost. I have had some great experience with the Bing ads customer support, they actually credited my account after I pointed out an error for them, so they can also help if you have questions. Let me know how it goes with your campaigns, I would love to see if what I explained in the article provided value that helps you out. I haven’t used bing ads before so please forgive me if some of these questions are noob questions :), but I am going to ask them anyway. I am particularly interested in what type of analytics or analysis is available within the bing webmaster tools (if that is even the right place for it) and not just within your site traffic google analytics or search console accounts. – how many people clicked you ad from particular countries? – how many people clicked broken down to the gender or age groups you requested? – how many people it was presented to but didn’t click? – anything about the keywords that got clicks or didnt? Great detailed comment, nice job. To answer your questions, Yes there is quite a bit of analytical type data available regarding demographics, search terms, countries that accessed your information. The stuff I explained in my article has metrics available with it to see how it all works out. In the main menu set up conversion tracking and get UET Tags set up. That gives Bing a way to use the tracking and see how you are doing. Also in the “reports” tab has many options for filters to determine how your ads are performing. I regulalry get data on clicks and click through ratio and what keywords are performing best. The main screen that you see that shows your ads performance can also be filtered to ad columns that you want to see up front.